Ever since I began to wake up to how bad things really were, in 2011, I’ve been trying to figure out WHEN everything really falls apart. And, every year, I’ve been wondering if that year would be our last good one. In fact, just a couple months ago, Bix Weir and Harvey Organ went out on a limb and said that everything would fall apart by the end of 2014 – a little over a month and a half from now. They still could be right, but Bix is already starting to edge back from this prediction. Were Bix and Harvey wrong to sound the alarm over what could happen over the coming months? Because something REALLY awful is coming, and if you jump too early, that’s okay. ‘Early Jumpers’ will find themselves to have been ahead of the game. And, with all that’s coming, being ahead of the game is a really, really good idea. Now, there are some of you who want someone to give a date so that you can have as much fun as you can before an awful future hits. You might be wanting to maximize your income. You might want to get as much profit out of your investments. You might want to get in one last family vacation. If so, you are a fool. And, unfortunately, that’s most of us. …five years early than five minutes late. Seriously, folks. Never play chicken with God. He rules the road, and He WILL run over you. So, get your poop in a group and prepare for really bad times. Okay, that’s not a date. That’s a person, and a somewhat annoying person, at that – since he has this knack for being always right about certain things. And, one of the things that he seems to be right about is cycles in economic confidence. Years ago, he discovered that every economy in the world follows an 8.6 year cycle, from peak-to-peak or trough-to-trough. When an economy hits a top and starts down, that economy won’t hit another top until 8.6 years later. 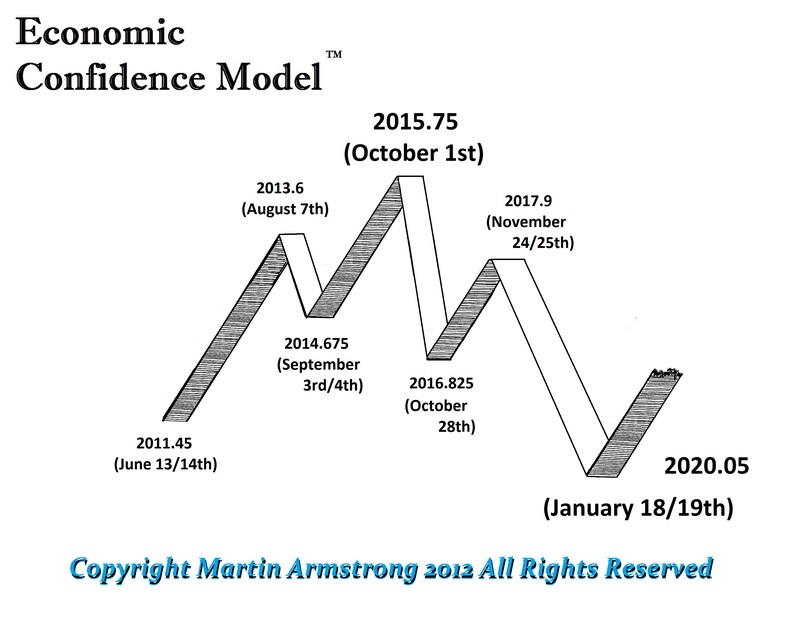 The Economic Confidence Model, or ECM. Martin has been uncannily accurate with his ECM, which is why I am paying attention to it. When it comes to when an economy turns direction, I listen to what Martin says. And, I’m willing to extend my favorable view of his abilities to his analysis of other cycles. But, when he gets into other areas unrelated to cycles… not so much. I find his analysis of the cycles of war and internal conflict to be compelling, but he is dismissive about the idea of precious metals manipulation, which I find to be strange. However, I’m not interested in his views on Gold or Silver. I just want to know when the economic system collapses. The longer answer will include an interim bottom by October 28th, 2016, with a small recovery that will end on November 25th 2017. And, a final bottom will arrive by January 19th, 2020. That was an article that he wrote on September 26, 1999, and the above graph uncannily predicted – ahead of time – the rise and fall of our economies. It’s more than a little shocking to see such accuracy. In fact, I don’t want to believe that we are so predictable, but apparently we are. Lord willing, I’ll be able to discuss the ramifications of Martin Armstrong’s Economic Confidence model over the next few days. But, for now, just consider the Summer of 2015 to be the last good summer that any of us may ever have. I agree with you Steve … I think we will barely make it through the summer before the end is in sight….one indicator is the Shemitah Sept. 13, 2015 end of the seven year Jewish cycle for the eradication of debt (previously in 2001, and 2008) which seems foreboding. Also, the end of the Fabius/Kerry 500 day prediction until climate chaos sets in on 9-24-2015. Don’t forget the 9-28 final blood moon on Sukkot’s last day or my personal favorite, the 6-28-15 Nemesis perihelion date, followed by a chaotic 3 month passage. Further, there is the new more GMT accurate end of the long count calendar Mayan date of 9-3-2015. “If we can make it through September” past our last, most glorious summer… “Jesus is coming soon, morning or night or noon…” …. looking up! It is indeed interesting to have this correlation. I have a theory about the connection to the year of rest. But, however it all works out, we MUST prepare. To sit and do nothing would be a sin. John, Most of the stuff you talk about is good. However, in my humble opinión Harvey Organ and Bix Wier are not worthy sources of information. They are liars and shills, or just ignorant folk that want the rest of us to think they are Smart at somethin. Well, they are not. Now, you are on to something when you mention Martin Armstrong. As you know, cycles can only predict the change of direction for a particular market. The prediction is for this to happen in Oct 2015 so we will see what happens. The stock and bond markets will eventually begin their bear market and this bear will we around for awhile according to Mr Armstrong. Marshall Swing also talks about this as well. PM’s are supposed to change direction at this time as well according to Marshall. Oh, Marshall Swing predicted 3 years ago that we would see 15 dollar silver so I am interested in what he has to say. You could be right. Next summer could be our last good one. But, maybe not. Lots and lots of writers and guru’s have just been plain wrong over the last 44 months. They are idiots and shills or just plain ignorant or maybe just crooks. I am skeptical. Thanx for the good write up but you should lose the references to loser writers and gurus such as Bix Wier and Harvey Organ. It is hard to believe that Harvey Organ and Bix Wier are either idiots or shills. They may, or may not, be wrong, but that does not that they are idiots or shills. If I get something wrong, am I either an idiot or a shill? We’ll see what happens in October. 2015 in October is the end of a Shemitah year. 2008 was a shemitah year, 1994 was a Shemitah year, 1987 was a shemitah year. Leviticus 25:8. 2015 is the end of a 7th Shemitah year and the Lord/YHVH is to say the law in the temple. Leviticus 25 is a contract which Jesus has to fulfill. With in that contract are two separate contracts. The Shemitah and the Jubilee which will be in 2016-2017 and that may or will be the second coming. The next one is in 2021. I will note the date predicted by the financial man is within 3 days of the final blood moon of the current tetrad. Does that mean anything? We’ll have to wait and see. I know I said I would keep my ‘heresies’ away, you have eyes but do not see. Naturally, you will not publish this link. It is just for you. I am not the Heretic my brother, Rome was the Deceiver and the Murderer of the Truth. I’m sorry, but gnosticism is a very serious heresy, and it is this heresy that drives the Illuminati. The gnostics have embraced a truly Satanic lie. If you follow in their ways, then you too have been captured. I’m sorry, Piper. I must continue to warn you that this path that you walk will lead to destruction and eternal suffering. You must repent of this. basically adding that the reason their is silence in heaven for 30 MINS, is because the rapture has taken place and the saints were in awe of being in the presence of the Lord. I must say, my ears were tickled with enjoyment when hearing this, but that is the excitement in meeting Jesus earlier than what is foretold in the bible. false teachers are going to be on the rise, even if their hearts are in the right place, they will lead those yearning to be taught about the bible into very precarious situations in life. I will say this, at least he doesn’t believe in a pre trib rapture, yet a mid trib rapture will still be a hurtful belief because you will think since you escaped the wrath of the Antichrist that you will soon be in the clear with the rapture. but what will happen to peoples trains of thought when they are looking up for Jesus and do not see him coming ? the last half of the great tribulation is the wrath of GOD , my hope for those people that are mid trib rapture believers is that they will not be shocked too much when they see GOD pouring out his wrath on those who took the mark of the beast and those not sealed by the blood of the lamb. During GOD’s wrath those sealed by the Blood of Jesus will have a slightly less cumbersome time because they will be incurring the Wrath of God. However it will make those who have the Mark of the beast Hate Christians even more because they will be in anguish and seek to hurt any and all Christians because they will be in full out rebellion against God , and since they cannot attack God, the next best thing for them is to attack those who have accepted Jesus as the son of God. Giving Glory to JESUS for he is WORTHY !! I understand your concern. However, I wouldn’t worry too much. Once the Antichrist comes, there will be a lot of people looking carefully at the scriptures. And, I’m sure that the Holy Spirit will teach those who survive. There won’t be very many of us, who will escape the Antichrist. A company called Deagel makes some rather interesting predictions for the year 2025. Check the population preds. for your neck of the woods. Answer-NIBIRU ,yea everything crashes alright,including the number of people on planet earth,Down to 51,000….from 7,000,000,000,so keep buying,at least you can brag you had it all,not that it will matter to anyone…and DON’T take the mark of the beast…..or you can’t get into heaven………………..
Hey JOHN,watch Bob Flecher Investigations.com, new video on nibiru,THERE won’t be any government warning either…..it’ll just have to be a surprise to every one,their last surprise….. I am NOT a real estate expert, but one of the things that is going to collapse is housing prices, so you will very quickly be underwater in any loan that you take out on a house. Better than that, get out of the US completely. There isn’t much time before it comes crashing down upon us. If this is so, I believe it may be the norm only until the final doom of the corrupt fiat system. I do believe that history works in cycles too. That time is not linear but circular. Non the less, when God judges or even when nature judges, catastrophic events may be on a totally different cycle of it’s own altogether. For when was the last time the US currency collapsed into the ground? It’s said they’re planning it to go down in phases. They will do a final helicopter money drop to keep the ship of fools floating yet a little while longer, this being the reset. Pingback: If Everything Is Just Fine, Why Are So Many Really Smart People Forecasting Economic Disaster? Jim Rickards once worked for the CIA and also was once part of a a USA government program called called ‘Project Prophecy.’ He has a video were he claims that starting in 2015, the USA may have economic collapse resulting in a 25-Year Great Depression. Thanks for the insight and commentary. I believe we have less than a year to get ready with next summer being the last good one. AGREE we need to be prepared but would argue that we should labor while it is day for the night cometh when no man can work. Lots to do and so little time. While there are many strategies for preparation, I think the Biblical one is best — trust in Jehovah with all thine heart and lean not unto thine own understanding, in all thy way acknowledge HIM and HE shall direct thy paths. I don’t believe now is the time to hide our talent but to maximize our profit (for the Kingdom). I’m not talking about playing till the rain comes and the door to the ark is closed but rather maximizing the harvest and preparing wisely — as God directs and gives wisdom. Most of all, we must act out of faith, not fear… for God has not given us a spirit of fear but of power and of love and of a sound mind. As God led the children of Israel through the wilderness, HE will lead us, if we will but follow. I may have not worded the above thought the right way but I hope you see my point? God’s Word is going to happen as it says and there is hope in Jesus for eternal life but we look thru the glass darkly but someday face to face. Don’t contribute to the delinquency of minors by giving them no hope. First of all, it’s not my prediction. But, my understanding of the Bible indicates that the end is very near. You MUST step away from your normalcy bias, Jerry. The end really is coming, and there isn’t time for going to school and having a career. The Last Days began in 1967, and there are very few ‘days’ left.